It’s not surprising that a lot of good and progressive people are inclined to cave in on the nomination of Donald Trump’s nomination of a hard right-wing judge named Neil Gorsuch to serve on the U.S. Supreme Court. Especially for non-lawyers, Gorsuch can look and sound smart and respectable and, especially compared to the buffoon of a president who nominated him, even impressive. Add to this the fact that so many progressives don’t really enjoy fighting with the Right and it’s understandable that folks are looking for excuses to duck this battle. The simple truth is that Neil Gorsuch and the people behind him represent everything that’s wrong with modern America. They (and he) are a threat to freedom, to progress, to diversity and equality and, ultimately when it comes to protection of the natural environment, the long-term survival of life on the planet as we know it. Gorsuch may be a nice and handsome guy who loves his family and likes to ski, but, in the end, that doesn’t count for squat. The hard reality is that on vital matter after vital matter over the next several decades, a Justice Gorsuch will simply be another friend and ally to the dreadful Samuel Alito and Clarence Thomas. Rather than helping to move our country forward, he will take it dramatically backwards. Now add to this the utterly outrageous fact that Gorsuch is being allowed to glide into a seat that was out and out stolen from President Obama. This is just wrong and something that can’t be allowed to take place without a knock-down, drag-out fight — even if it’s an uphill battle. The way McConnell, et al. 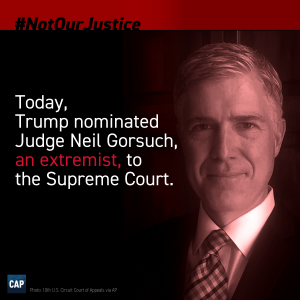 treated the Garland nomination was indeed unforgivable. Senators who fail to remember that will get an earful from their constituents — and, potentially, a challenge in the next primary. More importantly, those senators will be passing up a rare political opportunity. With just 48 votes, all Senate Democrats can do is filibuster, denying McConnell the 60 votes he needs for a final vote on the nomination. In response, McConnell could employ the “nuclear option” — changing the Senate rules to eliminate the filibuster for Supreme Court confirmations. In the end, Gorsuch would be approved anyway. In other words: In this absurd new political world we inhabit, the old rules of comity and cooperation are gone. What’s more, they ain’t coming back until progressives learn to fight back relentlessly against the bullies who are responsible for their demise.